Source: Federal Election Commission cases in which the civil penalties are $50,000 or greater; 1980 to 1985. 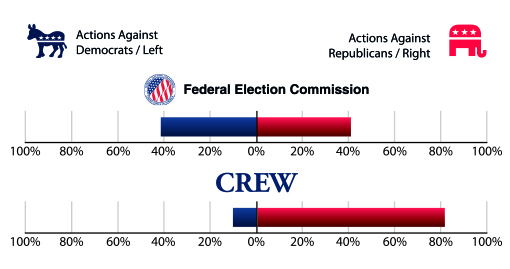 Between March 2004 and September 2017, CREW filed 53 complaints with the Federal Election Commission (FEC), of which 81 percent targeted Republicans or conservative-leaning groups. Yet according to a select list of cases compiled by the FEC, only 41 percent of the civil penalties of $50,000 or more levied by the agency between 1980 and 2015 were against Republican politicians or Republican Party supporters. Additionally, of the CREW complaints that targeted Democrats, some can be seen as advancing the goals of the Democratic Party. One complaint, filed in June 2010, asked South Carolina’s attorney general to investigate whether Senate candidate Alvin Greene was induced to run for office. Greene’s competency and fitness had been questioned by South Carolina Democrats, especially after it was revealed that he had been charged with a felony for showing a pornographic picture to an 18-year-old woman. Another CREW complaint, filed in June 2004, targeted Green Party presidential candidate Ralph Nader and his group Citizen Works. Nader’s 2000 presidential candidacy was viewed by many Democrats as siphoning votes from Democrat Al Gore. Between March 2004 to September 2017, CREW filed 54 complaints or requests for action with the House Committee on Standards of Official Conduct, also known as the House Ethics Committee, and the House Office of Congressional Ethics. Of those, 80 percent targeted Republicans while only 11 percent were against Democrats. The rest targeted both Republicans and Democrats. Yet only 35 percent of representatives disciplined since 1967 were Republicans, while 65 percent were Democrats. One CREW complaint, filed against Democratic Rep. Jane Harman on April 20, 2009, alleged that Harman had inappropriate dealings with the American Israeli Public Affairs Committee (AIPAC). Harman holds many hawkish positions on national security issues and AIPAC is often criticized by left-wing commentators. Other complaints against Democrats, most notably the one filed against former Democratic Rep. William Jefferson, were released long after federal investigators were on the case and newspapers had reported apparent corruption. Senate Ethics Committee: Between June 2003 and September 2017 CREW filed 27 complaints or requests for action with the Senate Ethics Committee. Of those, 85 percent targeted Republicans and a mere four percent targeted Democrats. The rest targeted both Republicans and Democrats. Yet since 1967 the Senate Ethics Committee has only formally expelled or censured three Democratic Senators and three Republican Senators. Source: Analysis of CREW’s investigation requests. Between June 2003 and September 2017, CREW requested 97 investigations by the Department of Justice and other federal agencies and law enforcement officials. This also includes requests for disciplinary action by state bars and other professional licensors. Of those, 72 percent were directed against Republicans. Only nine percent targeted Democrats. The rest targeted both Republicans and Democrats or were nonpartisan. An argument could be made that since Democrats were the majority party for 32 of the past 49 years, it would make sense that they would be disproportionately responsible for ethics violations. But Democrats also managed to equal Republicans in ethics violations during the 18 most recent years when Republicans controlled the House of Representatives. Between 1995-2007 and 2011-2017, 23 members of Congress were officially sanctioned or were the subject of public disciplinary letters; 11 were Democrats. Between October 2003 and September 2017, CREW filed 50 complaints with the Internal Revenue Service (IRS) asking for investigations of congressmen and other political organization. 49 of those complaints targeted Republicans or conservative nonprofit organizations. CREW’s contention that it focuses much of its firepower against Republicans because they are more corrupt is not supported by the facts. CREW began seriously targeting Democrats only after it received negative press for its political bias. CREW began to draw unfavorable attention from critics and tax experts by early 2006. That year, Republican Party officials considered filing an IRS complaint alleging that CREW’s activities violated its tax-exempt status. Some noted tax experts concurred that CREW’s lopsided focus on Republicans would raise red flags at the IRS. “At least preliminarily, I think they have a good case,” said former IRS official Richard J. Wood in a March 2006 interview with The Hill. “It looks to me that they’re probably right.” Wood cited memo #GCM 39811 from the IRS General Counsel, which states that even if an organization doesn’t explicitly intervene in political campaigns for elective office, a long-term strategy of engaging in prohibited behavior can be used against it. Rosemary Fei, who represents nonprofit groups as a lawyer with the firm Silk, Adler, & Colvin, told The Hill that the apparent one-sidedness of CREW complaints has already raised concerns. 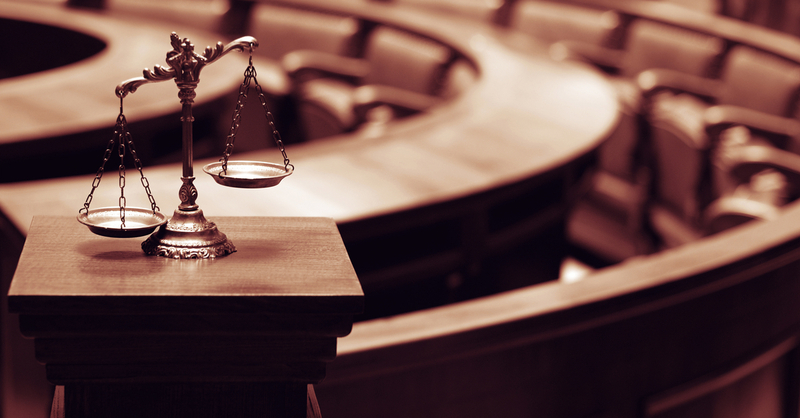 “If I were at the IRS, the imbalance of complaints would certainly cause me concern about whether the organization might have violated the political-intervention prohibition,” said Fei. Melanie Sloan claimed Republicans were just trying to bully her group into silence. She argued that CREW was actually targeting Democrats too since it occasionally criticized a Democrat and had co-signed a “Congressional Ethics Coalition” letter calling for the House Ethics Committee to investigate three Democrats and three Republicans. As CREW began to attract more negative press, it slowly began to target more Democrats. Eighty-five percent of the members of Congress named in CREW’s 2005 “Most Corrupt” report (then titled “Beyond DeLay”) were Republicans. By 2008, 71 percent of the members in the “Most Corrupt” report were Republicans. And for the first time in 2009, Democrats outnumbered Republicans on the “Most Corrupt” report, 53 percent to 47 percent. Every complaint CREW sent to the Senate Ethics Committee between June 2003 and December 2007 either exclusively targeted Republicans or was bipartisan. In January 2008, CREW finally filed its first Senate ethics complaint exclusively against a Democrat, albeit a conservative Democrat, Sen. Mary Landrieu of Louisiana. 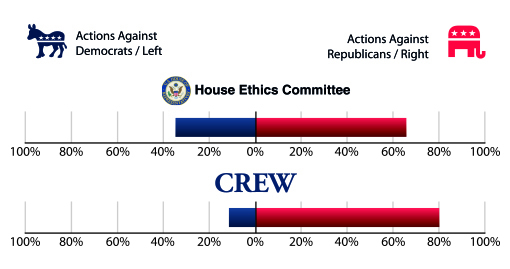 Prior to June 2008, all of CREW’s complaints to the House Ethics Committee either exclusively targeted Republicans or were bipartisan, with the exception of one complaint against Rep. William Jefferson of Louisiana (who was already under investigation). 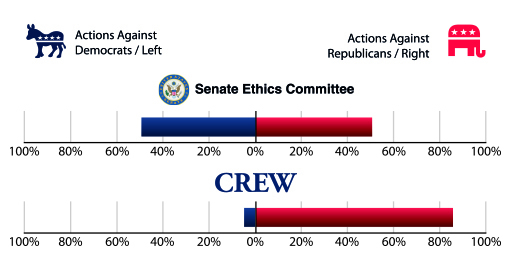 Since June 2008, CREW has filed ethics complaints against four Democratic members of Congress.